Originally published September 25, 2018, on Alberta Farmer Express. Jim Duncan has his bear stories, but so do all of his neighbours. The Clearwater County rancher has seen bears in his yard looking in the calf sheds, but has never had a calf taken. Wolves, however, have taken two or three animals while cougars — which are out there but rarely seen — have not taken any so far. There are more predators in his area, which Duncan puts down to the fact there are fewer farms and people than there once were. So Duncan, a former biologist, has made adjustments — including for his personal safety. When it comes to protecting his livestock, he looks at his operation from their hungry eyes. “Man-made food sources can be more nutritious and higher than supply in the wild,” he said during a recent West County Ag Tour. “That includes things like the granaries, the silage, and the livestock — especially the ones that are penned up. 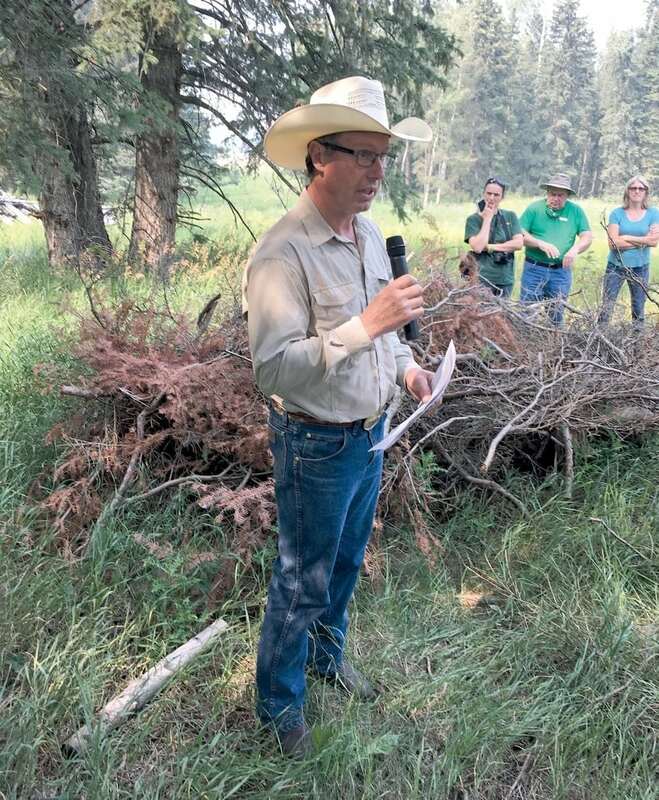 Duncan offered several tips for those who are seeing more predators on their farm — something he expects will happen more often as bear and wolf populations in the ‘fringe areas’ are increasing, which pushes the animals farther east. To deter bears, replace any of those old wooden granaries with steel bins, but if the bin contains treated seed, leave the door open. That’s because bears have good memories (something that works against you if you inadvertently provide a tasty meal). That’s why Duncan takes care to ensure he’s composting deadstock properly, usually by composting it in the manure pile. He recommends keeping cattle in one large group. He rotates through fairly small pastures, with off-site watering and keeps the herd constantly moving. In some cases, he uses electric fencing. “I am visible and leaving my scent out there as well, and the horses are out with me, and that kind of thing,” he said. He calves close to home and keeps the calves in a corral close to the barn for two to three days. When the calves go out, they go with the herd. Duncan also recommends trail cameras for producers who want to know what’s happening on their land at night, when bears are often out. People need to know bears’ strengths, said Chiara Feder, a wildlife biologist with Alberta Sustainable Resource Development. Male bears tend to migrate in the spring as they need about 25,000 calories a day after emerging from their dens. The Alberta government doesn’t know how many bears there are in the province since it stopped collaring them, she said. If you see a bear on your property, you should call Fish and Wildlife. Putting electric fencing around calving areas or beehives can be expensive, but the cost of losing them to a bear can be even more costly, she added.